A local company, run by a trio of endurance athletes, delivers real food bars full of the good stuff an active body needs to fuel. Walk into any supermarket and it appears bars have taken over—performance bars, meal replacement bars, health food bars, and protein bars with soy, whey, rice, or legume proteins, smeared with chocolate, glazed in sweeteners or filled with additives...it's a daunting choice. 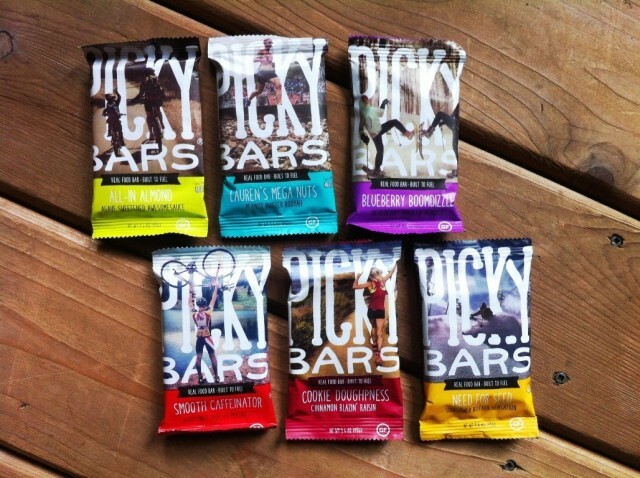 Bend-based Picky Bars hope to offer a simple solution to athletic nutrition indecision. Made with organic, non-GMO ingredients, these real food bars want to help out on your next run, hike, or biking trip. Why be picky? Lauren Fleshman—a runner, two-time USA 5K champion, and five-time NCAA champion—was looking for a bar that would fuel her training and nutritional needs, one that did not consist of artificial ingredients or additives. Jesse Thomas, Lauren’s husband and four-time Wildflower Triathlon winner, needed something easily digestible and gluten- and dairy-free. Steph Bruce, friend of Fleshman and sub 2:30 marathoner, also wanted tasty, balanced, gluten-free fuel. After some trial and error in the kitchen, the result was a performance bar made with real food, balanced for sport. Simple, whole ingredients packed into a dense, chewy rectangle—Picky Bars was born. At 200 calories, 7 grams of protein each, Picky Bars have a 4:1 ratio of carbs to protein. According to Angela Shatting of the Picky Bar team, this is the ideal balance for performance and recovery. The bars are gluten, dairy and soy free, are easily digestible for those with intolerances or those moving fast during an endurance sport event, and feature sea salt for electrolyte balance. No artificial ingredients are used, and many are locally sourced and organic whenever possible. All-In Almond is a hearty, agave-sweetened treat full of protein- and vitamin-rich almonds. Price: $2.75 per bar, or discounts on bulk or gift orders. Can't decide? Try a 6-bar sampler or join the Picky Club for monthly deliveries. In 2015, club members will receive training tips from professional athletes along with their bars.